AKIPRESS.COM - A new World Bank report analyzes the efficiency, equity, and effectiveness of higher education in Tajikistan, and suggests policy reforms that could be undertaken to enhance the quality and relevance of higher education for labor market demands. 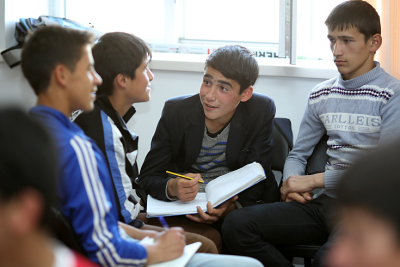 The first decade of the 21st century saw a rapid expansion and development of higher education in Tajikistan, which has started to stabilize in recent years. Today, the country’s enrollment rate in tertiary education (university and college) is 22 percent which – although lower than most countries in the Europe and Central Asia region – is much higher than countries at a similar level of economic development. Nevertheless, some important challenges remain. For instance, access to higher education is highly inequitable – by gender, socio-economic status, and geographical location. Less than one third (30 percent) of students in higher education are female. Two thirds (65 percent) of all students come from households in the top 40 percent of the income range, while only 16 percent come from the bottom 40 percent. It is widely accepted that regardless of a country’s level of economic development the benefits of higher education are multiple and diverse. For example, university and college educated individuals are more likely than those without such an education to find a stable job in the formal sector, earn a higher income, and avoid being trapped in poverty. Tajikistan’s government has set-out a clear vision for the future of higher education: as a tool for human capital formation that can further enhance economic growth in a rapidly changing world. To this end, the National Strategy for Education Development Up To 2020 aims to modernize higher education so that it is geared specifically towards professionally-oriented skills that can better meet evolving labor market demands. The government is also focused on joining the Bologna Declaration, with a view to integrating with the European Higher Education Area. However, major reforms still need to be developed, adopted and operationalized – including the establishment of a credible quality assurance system and national qualifications framework. Higher education governance, quality assurance, teaching, learning, and student assessment are also areas in need of attention. A number of ways to strengthen governance and quality assurance mechanisms at the system level, as well as institutional levels, have been identified. One such recommendation is to revise and streamline the national quality assurance framework and tools in accordance with European Standards and Guidelines for Quality Assurance. Another proposal is to allow more flexibility for Higher Education Institutes (HEIs) to involve employers and other stakeholders in developing programs that can ensure courses, programs and degrees meet acceptable academic and professional standards – and better respond to labor market demands. In terms of financing, the government is encouraged to increase public funding for higher education, especially for quality enhancement activities, provision of needs-based financial support for disadvantaged students, and research funding for HEIs. If tax incentives are created for HEIs, the Institutions can increase and diversify their revenues and encourage the private sector to invest in the sector. Increased private sector participation is likely to enhance competition and diversity, and also reduce burden on public funding for further expansion and quality improvement of the sector. Greater equity and access to higher education could be achieved through the creation of financial support mechanisms that target under-represented students. Also, the needs of disadvantaged students, working adults, and women could be better served by enhancing the quality of distance learning education. Information and communication technologies (ICT) can play an increasingly important role in higher education in Tajikistan. Recently, four piloted ICT-based solutions in the country demonstrated that there is potential to use ICT more effectively to improve access, quality and relevance of higher education, including through online and distance learning. Public-private partnerships can also play their part by helping to overcome challenges such as a lack of online content, weak capacity of ICT experts, and ineffective ICT investment.